For people to perform at higher levels, they need to have both ambitious goals and effective feedback. One without the other is not enough, so valid feedback is essential. 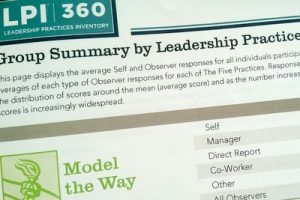 The Leadership Practices Inventory® (LPI) is a 360° instrument that measures the frequency of 30 behaviors, identified by authors Jim Kouzes and Barry Posner, as the behaviors that leaders engage in most frequently while performing at their best. The newly revised edition was released June, 2017. Research has shown that the more frequently an individual is perceived as demonstrating the behaviors, the more likely that person will be identified as an effective leader. The LPI is a tool which helps leaders assess the extent to which they actually use those practices, so that they can determine a workable strategy for improvement. • It is simple and concise. It is a 30 question inventory that focuses specifically on proven leader behaviors. It usually takes 10 – 15 minutes to complete. • It is usable. The key question for any survey is, “do people use it?” Recipients tend to continue referring to the LPI, because it is easy to find the specific feedback they are seeking. How valuable is survey feedback if the recipient never uses it? • Its reliability and validity have stood the test of time. As people improve their scores on the LPI, they are able to achieve higher, measurable leader outcomes. • As part of the LPI feedback, recipients receive comparative data, which allows them to clearly see how their scores compare to thousands of others who have participated in the inventory. • Group data can easily be kept for groups of all sizes, from a project team to an organization. • Our three-decades of experience with developing leaders has proven that people can improve their leadership capabilities from focusing on the items measured by the LPI. Simply speaking, it works. 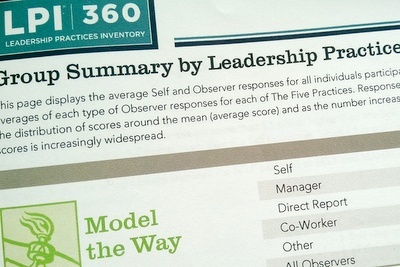 The Leadership Practices Inventory is the best behavior based leadership assessment available today. Thoroughly researched and recently revised, it provides the roadmap on leaders are actually doing when leading at their best. For more information, please contact ILA.